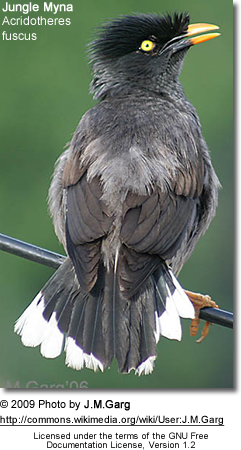 The mynas (or mynahs) are birds of the starling family (Sturnidae). This is a group of passerine birds which occur naturally only in southern and eastern Asia. Several species have been introduced to areas like North America, Australia, South Africa and New Zealand, especially the Common Myna which is often regarded as an invasive species. 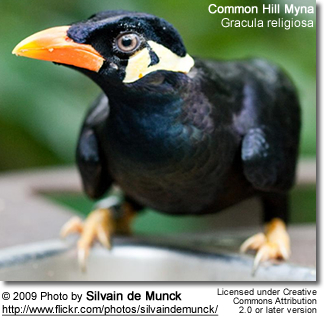 Mynas are not a natural group (Zuccon et al. 2006); instead, the term myna is used for any starling in India and surrounding areas, regardless of their relationships. This range was colonized twice during the evolution of starlings, first by rather ancestral starlings related to the Coleto and Aplonis lineages, and millions of years later by birds related to the Common Starling and Wattled Starling's ancestors. These two groups of mynas can be distinguished in the more terrestrial adaptions of the latter, which usually also have less glossy plumage except on the heads and longer tails. The Bali Myna which is nearly extinct in the wild is highly distinctive. Mynas are medium-sized passerines with strong feet. Their flight is strong and direct, and they are gregarious. Their preferred habitat is fairly open country, and they eat insects and fruit. Several species live around habitation, and are effectively omnivores. Plumage is typically dark, often brown, although some species have yellow head ornaments. Most species nest in holes. Some species have become well-known for their imitative skills. 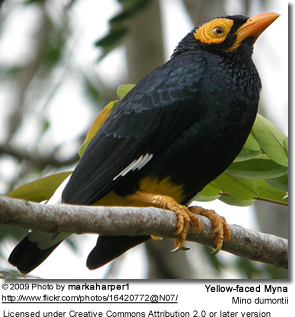 The following are species of Mynas. The Coleto and the two Saroglossa starlings are included because of their position in the taxonomic list.